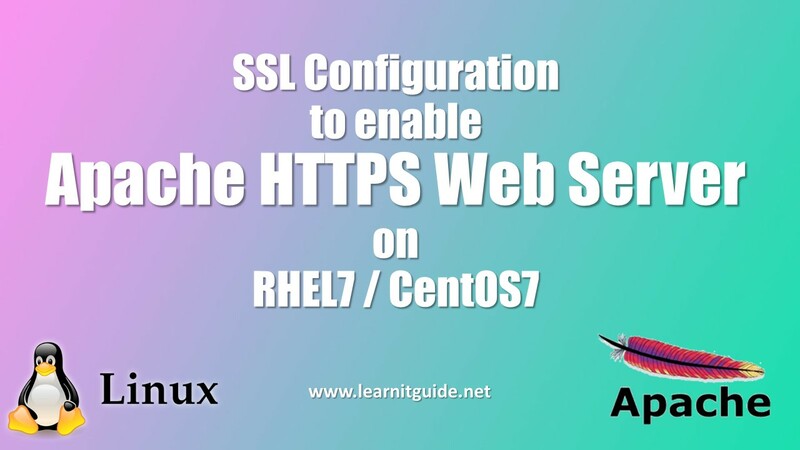 This article describes you how to setting up or enable Apache HTTPS (SSL) Web server with self-signed SSL certificate on Linux (RHEL7 / CentOS 7). A self-signed certificate will not validate the identity of your server, since it is not signed by a trusted certificate authorities, but it will allow you to encrypt communications between your server and your visitors. 1. We must have configured Apache HTTP Web Server, Refer this link to Install and configure Apache HTTP Web server on Linux. 2. Yum Repo must be enabled to install the required packages. Refer this link to configure the Yum Repo Server - Configure YUM Repo Server on Linux. Once your Apache HTTP Web Server is ready, Use the following instructions to setting up the Apache HTTPS (SSL) Web Server on RHEL7 / CentOS7. 1. Install the SSL Module. Install the appropriate package "mod_ssl" using yum to avoid dependencies issue. Apache Web server will be able to start using an SSL certificate after the httpd service is restarted. 2. Generate a New Certificate. The certificate will store some basic information about our site, and will be accompanied by a key file that allows the server to securely handle encrypted data. You can also create a dedicated directory for each websites and keep the certificates safely if you hosted multiple websites on a single node. use "openssl" utility to create the SSL Certificate. After we enter the request, this will prompt for a input where we can enter needed information about our website. Replace "node1.learnitguide.net" with your server name. Search for the directive "ServerName" in the same file and replace with your server name instead of "node1.learnitguide.net". 3. Restart the httpd service. Open the browser from client and enter the URL https://node1.learnitguide.net. you could see the message as "This Connection is Untrusted" as shown in the below image. Just click "I undestand the Risks" and Select "Add Exception". This will popup an box as shown in the below image. Just select "Confirm security exceptions". That's all about setting up Apache Web Server with https (SSL) on Linux Servers.